SUMMARY: Taking advantage of social media's ability to reach broader audiences is a staple in inbound strategies. However, simply posting content is not enough to capitalize on some social platforms. 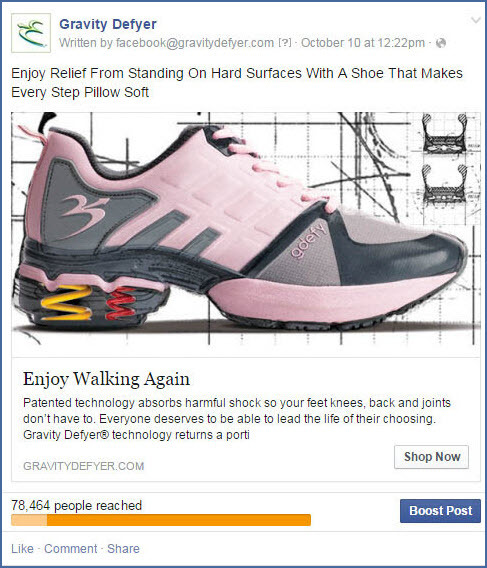 Gravity Defyer, a shoe retailer, turned to Facebook to help increase brand awareness and connect with customers on a more personal basis. However, it wasn’t until the marketing team began to utilize Facebook's features that it truly reaped the benefits of the platform. Learn how using Facebook as a customer service portal, posting organic content and leveraging paid services, the company was able to secure an average 450% ROI. Gravity Defyer prides itself on being a wellness shoe company, offering advanced patented footwear technology in every product sold. Its mission is to help every person achieve new levels of performance, protect their bodies and live pain free. Currently, Gravity Defyer's audience demographic is adults 45 to over 50, but the marketing team is looking to target a broader demographic. The team understands how important foot health is for a person's overall well-being and strives to teach an audience from 20 to 40 years old about prevention of health issues that come later in life, some due to poor physical activity. In more mature customers, the company aims to help in alleviating discomfort and pain and to help them find a more comfortable shoe that fits their everyday activities. With a goal to target broader audiences, the marketing team at Gravity Defyer turned to social media to gain more brand awareness. The team has found Facebook to be an effective channel to focus on brand identity, customer service and targeting customers for remarketing. It uses Facebook to directly talk to customers and make sure any customer service issues are addressed through the channel. Gravity Defyer’s team leverages promoted and boosted posts to reach more people with the ultimate goal to drive up revenue. The Facebook effort at Gravity Defyer began in 2012, but leveraging its features, including advertising, did not begin until 2013. Megan Light, Social Media Marketing Manager, Gravity Defyer, was brought onboard to help create more content for the brand and to further leverage the platform's capabilities to advertise via promoted and boosted posts. As Light and Sarah Olea, Public Relations Manager, Gravity Defyer, explained, the company was leveraging direct response marketing for a large part of its business life. "We wanted to create a social presence. Gravity Defyer has been a direct response company for a long time, so creating content that will be engaging to help customers engage with us and help us to answer some of the questions that they might not want to just pick up the phone or do research," Olea said. However, the team also wanted to use the same direct response method to add advertising and remarketing to the Facebook account. The goal was to start a presence on Facebook, target the current customer base and start to widen the demographics by reaching younger audiences as well. Light creates ads for Facebook with the help of Gravity Defyer's creative department. Ads appear in the brand's targeted audiences' newsfeeds and will change based on their performance. "We'll use an ad, and if we notice the impressions aren't doing well or they're going down, then we know to change them," Light said. 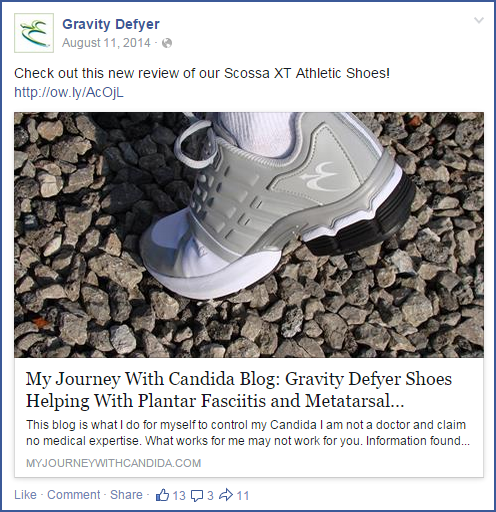 Light bases ad campaigns on Facebook according to what new products Gravity Defyer is launching and the most popular shoes with consumers. Ads typically contain an image of a shoe with background information on the technology in the product. Light and Olea bounce ideas for Facebook ads daily and work with another team member who also works in paid advertising for the company. They will research what's happening in the news and what's happening in the company, including insights into top sellers and which shoes have the highest stock. Events the company is involved in provide another aspect in strategizing Facebook ad campaigns. For example, the team participated in a diabetes walk and posted ads and content around that event. For campaigns that do not perform well in terms of engagement and number of conversations in each ad, those ads will be paused. For successful campaigns, the team will refine and improve those for future postings. The team runs four campaigns at a time on Facebook, and they are changed out once a month to keep the offers fresh to audiences. "We want people to be excited about what they see, and if people see the same thing over and over again, they are going to be like, 'I already saw this. I don't want to go to this website,'" Light explained. To target ads to Gravity Defyer's audience, the team leverages features in Facebook advertising to get the most ROI from campaigns. The platform will take the current demographics of people that are liking the Gravity Defyer Facebook page and will target other users with similar characteristics. These characteristics would include age, household income, marital status and geographic location. Organic content is created to share on the Gravity Defyer Facebook page to engage with audiences. Light looks back at successful organic content posts from the beginning of the brand's Facebook presence to model new posts on those that resonated well with users. Light strives to make organic content posts on Facebook visually appealing with related captions. She also bases organic content on causes the brand is involved with, including diabetes and arthritis awareness. To stay organized and plan out content, the team utilized an editorial and PR calendar that highlights certain events the company is involved in. The social team will be aware of an event Gravity Defyer participates in, such as the American Diabetes Walk, and will post content inviting their audience to donate to the cause or join the team at the event. Also, as November was Diabetes Awareness Month, the team gave away a pair of shoes on behalf of the cause. News releases are utilized to drive more engagement with the brand. Releases will focus on Gravity Defyer's medical research studies or new products that will be featured in magazines in an editorial space. Light also runs affiliate programs with bloggers, who will receive a pair of Gravity Defyers and write reviews of them. "So when the review comes out, we'll send it out to all the employees, and then we'll schedule different Facebook posts to make sure that we share that same post on all the social media platform," Olea said. Using an affiliate program, Light finds bloggers for the brand based on fitness, lifestyle and wellness writers, "people that our customers can relate to," she explained. "Our shoes retail between a $150 and $300, so we definitely want to make sure that when we're sending out shoes to bloggers that we’re going to have an impact on their fans, their followers that we're going to be able to reach a certain number," Olea said. Even if a blogger only has 500 followers, but the content is well-written and fits in the Gravity Defyer's brand, the team will engage with them versus a blog that has 100,000 followers but includes unrelated content. To further locate appropriate bloggers, Light will search the Web and contact bloggers directly to help create a personal connection with them. Once a blog post featuring a product review is complete, the team will review the post to ensure it matches the brand's look and feel before it is shared on Gravity Defyer's social media audience. Light explained that to achieve the most effective ads on Facebook, the team deploys A/B testing to discover what resonates with the Facebook audience the most. "We'll use the same picture and then have different captions and see which ones perform better. Then, based on that, we'll use the ad that performs better," Light said. In organic content that is created for Gravity Defyer, Light researches trends in engagement to analyze what content performs best. She has discovered that content that includes more exclamation marks and emoticons receives more likes on Facebook when compared to other content. Boosted posts are also tested to discover what resonates best with customers, allowing the team to allocate funding more effectively to those posts. Boosted posts allow marketers to allocate a certain dollar amount to a post, widening the reach of that post. Facebook serves as a customer service channel in which fans of Gravity Defyer often post questions about products. Light tracks all comments on the Facebook page each day and ensures that commenters receive a personal reply as quickly as possible. If the customer is looking for a product, Light will include links to whatever shoe they are looking for to ensure they are directed back to the brand's ecommerce site. "As much as we want to interact with them, we also want them going to our website," Light said. When complaints arise, Light will direct the comment to customer service when she does not have the solution for them. Light trained with customer service for a week upon first starting at Gravity Defyer to learn basic best practices for handling customer comments and complaints. She has supplemented that training by reading up on blogs about how to best interact with customers and performed research on what other companies do and how they interact online. Light advised other marketers charged with handling customer service online to always be patient and polite when handling difficult situations. "I feel like Facebook made it easier for the customer to have a voice and have power, and so now big companies don't really have the right to do whatever they want. They have to own up to what the customers need, and I think that's kind of overall a good thing for everyone," Light said. In better leveraging Facebook for customer service, the marketing team is striving to achieve effective communication with the customer service department. "Sometimes even Customer Service may find out if [a post] is working before we review the report, because they'll call and say, 'Hey, a lot of people are calling about this post or about this ad,'" Olea said. Customer service also receives notifications from customers if a particular coupon code presented in an ad or email isn't working correctly. In being proactive about prepping customer service for calls, Light or Olea will monitor posts that are doing well on Facebook and let the customer service reps know ahead of time they might receive calls on those posts so they are fully aware of what that promotion entails. "Some of the promotions we run on Facebook may be exclusive to social media, and so some people may see that and pick up the phone to place the same order. So, Customer Service has to be aware of how to redirect the customer to either go back online or they will walk them through the process," Olea said. Since fully implementing Facebook into its marketing efforts in 2013, Gravity Defyer has doubled its revenue attribution from Facebook in the past 10 months. The team is also seeing one-fourth of its overall website traffic are customers coming directly from Facebook. As a result from their efforts on Facebook, the team saw an average ROI of 450%, with campaigns ranging from 300% to 600% ROI. The team has also been contacted by Facebook to film a case study video to feature Gravity Defyer on the Facebook company testimonials page. As for advice for other marketers looking to up their Facebook game, Olea recommended marketers remember that Facebook can be, and should be, used for many reasons including direct response and customer interaction, "which builds loyal, return customers and consistent revenue." "Our efforts have definitely proven the value in being a company with an active social media presence, and we will definitely continue to test and improve our campaigns to help drive growth and revenue for our company," Olea said. Light added her favorite part about using Facebook for marketing is talking directly to customers and building a loyal base along with brand awareness. "There is just no reason not to be on Facebook right now," Light said. Olea explained that while it may be more challenging to prove ROI from brand awareness, it is worth the investment to use ads and boosted posts because it improves reach and helps to bring in new customers. "That's what ultimately helps to prove that you are generating an ROI from social media," Olea said. Coming up in 2015, Gravity Defyer will be launching new styles and its new slip-resistant shoes, as well as a new pain relief study conducted in a partnership with UCLA and Olive View Medical Center that will be promoted via social media. The team will also be organizing new contests and giveaways for its Facebook audiences. "Now that we can see the ROI and the money that we've investing, we’re definitely going to be able to have a larger budget to allocate to Facebook. And that's definitely going to help us out as well," Olea said.